Now…I’m as obsessed with Skin care as I am makeup…. It’s imperative to have a great, reliable and effective skin care regime, in doing so you will allow your makeup the best possible chance of looking great and staying put! With Brides this is more important than ever…I always try and help all my brides to be to get themselves onto a solid and responsive skin care regime at least 6 months before their special day, (if they are not already following one). I’ve chopped and changed up my skin care many times over the years….going from the luxury, expensive regimes, to good old ‘Ponds’…I’ve found a range I am really excited about though, it works…let me tell you a bit about it…. 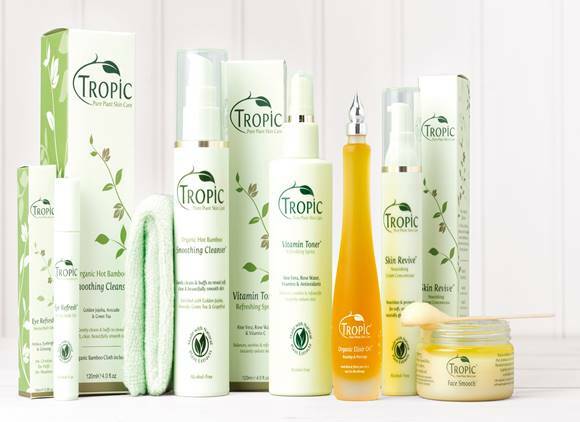 Tropic Skin Care has been created by former Apprentice contestant Susan Ma, and Lord Alan Sugar, who after seeing the massive potential and gap in the market for natural skin care, came on board as a partner. Products are handmade in a large beauty kitchen in Surrey, 100% natural, Vegan and Cruelty free. The ingredients are of a premium quality, are made with natural plant extracts and importantly are free from mineral oils, parabens, alcohol and other such ‘ unnecessary irritants’ added to so many other products on the market today. I have tried it all, its effective and luxurious, they have a beautiful 3 step facial routine that is perfect for brides to be. It’s well priced and smells divine! My favourite product and one I use on all my clients prior to makeup application is the Skin Revive Nourishing Cream Concentrate. This cream is £20 for 50mls….a great price I would say. It has a wonderfully super smooth, rich texture, which visibly firms and intensively nourishes to soften and protect your skin. With over 18 different pure fruit, flowerseed and plant activities…it’s a super cream and I’m so glad to have this in my kit and on my bathroom shelf! Tropic is something that I was so impressed with, I decided to retail it myself to all my lovely clients…especially all the Brides to be. So if you are stuck in a skin care rut, need something new and fabulous to help rejuvenate and improve your skin before your wedding day, then Tropic can help. Contact me for a chat and more info…as the catalogue is just gorgeous, or order here, through my online shop. Error: Error validating access token: Session has expired on Saturday, 09-Feb-19 07:40:21 PST. The current time is Wednesday, 24-Apr-19 19:32:20 PDT.